Despite having been around for as long as they have, the podcast revolution has always kind of flown under the radar. Certainly every now and then one arrives which takes the world by storm like Serial, This American Life or Welcome to Nightvale, but it still has all the veneer of a niche market, somehow. The notion of episodic radio that you can download (usually for free) has always been appealing, to me it felt like a latter-day equivalent to long car journeys with my parents listening to The Goon Show on CD, unfettered by advertising or traffic reports. There is one particular format which the podcast has done more in aid of than any other, though. Interviews take on many different forms, from the informative to the amusing to the controversial, but I would argue that the long-form interview, particularly when it’s one-on-one, found its ideal medium when podcasts came along. They did talk about a lot of socio-political issues during the interview, particularly Charleston, at which stage Obama dropped the N-bomb (which, sadly, ended up being the most widely reported part of the whole thing), but they covered a lot more ground than that during the hour-long piece. Maron has brought on an incredibly impressive range of guests over the past 6 years, recent examples include Judd Apatow, Sir Ian McKellen and in 2010 when longtime friend Louis C.K. turned up on the show, the content of the two-part interview was so emotional, deep and thought-provoking that Slate have since hailed it as the best episode of any podcast ever. They also cited it as the landmark moment when podcasting came of age. The thing is though, whilst Maron’s show does boast a huge roster of well known interviewees, the level of appeal doesn’t just depend on that. There is something to be said for being offered an insight into the mind of a well-known individual, but the more of these kinds of podcasts you listen to, the more clear it becomes that it could be almost anyone, as long as interviewee and interviewer are equally interested in what they’re discussing, the appeal will manifest. My best friend (perhaps the biggest ‘cast connoisseur I know) made the point that this has a lot to do with the fact that podcasts like this rarely carry any kind of promotional bearing or financial incentive, the people who appear usually relish the opportunity to just sit and chat for an hour or two. That goes some way to explaining why somebody like Marc Maron can draw in the guests that he can, because he’s offering them something no other interviews are – the chance to relax, even the chance to actually be themselves. Take The Nerdist, for example, Chris Hardwick and the rest of the team interview some extremely well known people, but there’s so little standing on ceremony or adherence to format going on that they could end up talking about anything. Sam Raimi, for example, spends the first odd 15 minutes of his interview talking about his gardening habits. Even someone with as bombastic a reputation as Tom Cruise comes across like someone you might have struck up a conversation with at the pub. This isn’t someone being dragged through endless press junkets being asked the same thing again and again, someone endlessly repeating the same practised clutched of rehearsed cues, this is just someone sitting and chatting. Nobody needs to tell you how to sit and chat for an hour, you just need to have something interesting to talk about. Hosts all have their own ways of assuring that this happens, but the casual atmosphere which presides over almost all interview podcasts almost does it by itself. The JV Club is possibly my favourite example of this. Hosted by Janet Varney (perhaps best known for voicing Korra in The Legend of Korra), the show features interviews with women (and men, during the summer) from various different crafts from acting to journalism to music to art about growing up, their school lives, their relationship with their parents and everything that leads into. For the most part, Varney conducts the interviews in her own home and consistently ends up talking about herself a fair amount and relating her own experiences back to the guest. One of the first tenets of interviewing that I learned when I started doing it was that you’re there to make the other person seem interesting, it has nothing to do with you, but Varney gloriously flouts that maxim and her show is all the better for it, because it creates a level playing field. In breaking the typified rules of the interview as they had previously been defined (always be asking questions, only be talking 10% of the time, don’t contradict the guest, steer clear of difficult topics), shows like The JV Club have helped to reinvent it. The level of voyeuristic enjoyment somebody can take from an interview increases massively if it feels unedited, raw and unrehearsed. Scroobius Pip has enjoyed massively positive feedback since starting his Distraction Piecespodcast last year and it is perhaps the most raw of them all, the conversations are often tangental and digressive but in the best possible way. When he had Eddie Temple Morris on the show you could be forgiven for thinking they would mostly talk about music but the principle topic ends up being depression and mental health awareness. Of course with Distraction Pieces, popularity isn’t any kind of arbiter of who to invite onto the show, Pip picks out who he wants to bring on regardless of how well known they are and in fact many of the better episodes feature guests who aren’t even remotely famous. It’s simply predicated, once again, on the notion that everyone has an important story to tell. Moving in the exact opposite direction, that notion can sometimes provide the framing for the whole thing, as with shows like I Was There Too. In it, Matt Gourley sits down with people who have an insider’s perspective on classic films and TV shows. Not the stars, not the directors, just people who worked on the shoot, their position in the hierarchy is irrelevant, the important thing is that they were there and they’re going to provide you with a unique insight into something you love. I sometimes catch myself thinking that I’d happily just listen to some of these people talk about film in general for a further few hours. There’s a simple joy in the ability to just download a conversation and take it out into the world with you, radio interviews are often hampered by time constraints and TV interviews have to have some kind of visual stimulus, which often leaves them feeling cluttered or lacking focus but podcasts just are. In the same way as audiobooks, they compliment long distance travel or any kind of physical activity that doesn’t require you to read anything beautifully because two different parts of your brain are being simultaneously engaged in a near-perfect balance. Recently I was helping a friend get ready for a big family event and ended up spending more than 2 hours chopping firewood whilst listening to the J. Cole episode of The Combat Jack Show. I was never even remotely bored or worn out (until later when the aching came). When Marc Maron started doing The WTF his career was in a tailspin, his old radio show had been cancelled and the podcast almost felt like a kind of death knell. 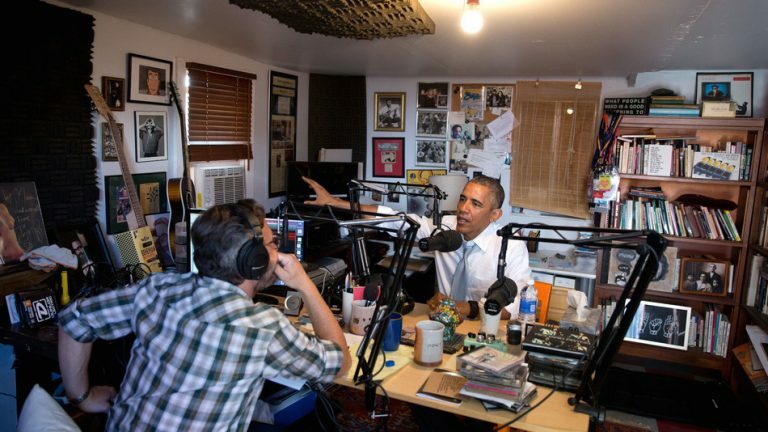 For the first few episodes he actually snuck guests into his old studio without permission to record before moving everything into his garage (or elsewhere, depending). What he could not have realised at the time was that he was breaching a new horizon, a rebellious, important one. Culturally, so much of our current content is short-form, ephemeral and often visually grounded, we live in a world of 140 characters, AMAs and badly filtered Instagram photos, all of them enemies of the art of conversation, be it participatory or interview-based. Interview podcasts are swimming against that current and they are doing remarkably well. It’s still a niche, in the grand scheme of things, but it’s one of the most valuable modes of modern entertainment out there and there are literally thousands of different ones to find and enjoy. 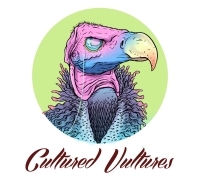 Would you listen to a Cultured Vultures podcast?